Victor Slobe was born in North Chicago, Illinois, on December 7, 1917. He played baseball at Waukegan Township high school, and semi-pro ball in North Chicago, before traveling the country for three months with the House of David during 1939. Slobe finished the season pitching for the Winnipeg Maroons of the Class D Northern League. Aged 22, he signed with the Wisconsin Rapids White Sox of the Class D Wisconsin State League in 1940, and the lanky 6-foot-3-inch, right-handed pitcher was 10-10 in 29 appearances with a 3.89 ERA. 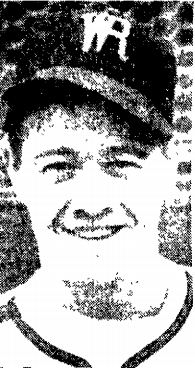 In 1941, with the same club, Slobe was 2-8 in 20 appearances, with a 5.01 ERA and a respectable .258 batting average. With the United States at war (the Japanese attacked Pearl Harbor on his 24th birthday), Slobe entered military service with the Navy in 1942. On November 8, 1942, Seaman First-Class Slobe was part of Operation Torch, the Allied invasion of North Africa, helping American troops ashore at Fedala, French Morocco. Vichy French forces put up stiff resistence to the invasion and Slobe was hit in right leg by shrapnel. He was again wounded in the back and hip when a French fighter plane machine-gunned the beach. On November 11, he was one of 30 casualties taken aboard the transport ship, USS Joseph Hewes (AP-50), which was anchored off-shore, but that same evening the ship was sunk by a torpedo from a German U-Boat. Slobe was in the water 15 minutes before being rescued. He returned to the United States shortly afterwards and recuperated at Norfolk Naval Hospital, Virginia. Slobe later returned to active service and went on to serve aboard the aircraft carrier USS Yorktown, the transport ship USS Okanogan and the Landing Craft, Flotilla Flagship LC(FF)-423. He didn't return to professional baseball after the war. Victor Slobe, ballplayer, wounded veteran and recipient of the Purple Heart, passed away, aged 69, on September 24, 1987, in Wadsworth, Illinois.